I dithered at the rest below the roof, breathing deeply and alternating hands across an undercling flake at my waist. Below was the steep off-finger splitter crack and blunt arete I had just climbed. Above me a sharp finger crack split a small roof and carved a path through a shield of granite to a stance somewhere above. Or did it? Climbing a new route ground-up, deep in the High Sierra backcountry, is a beautiful game of discovery. Appearances are usually deceiving. I thought that if I could reach the crack system 45 feet above, the route would go. But that scenario was based on information gathered through binoculars at a lake a quarter mile away the evening before. Now the wall bulged steeply, preventing me from seeing the path ahead. Would it go? Was I capable? I was about to find out. "OK, watch me!" I shouted down to my climbing partner Austin Siadak, and launched up the crack. In July 1974, Fred Beckey, Rob Dellinger and Debbie Winters hiked into Sequoia National Park and climbed the north face of a beautiful wall of golden granite rising above Spring Lake on Peak 11,440+, an unranked subpeak north of Sawtooth Peak (12,343') in the park's Mineral King area. 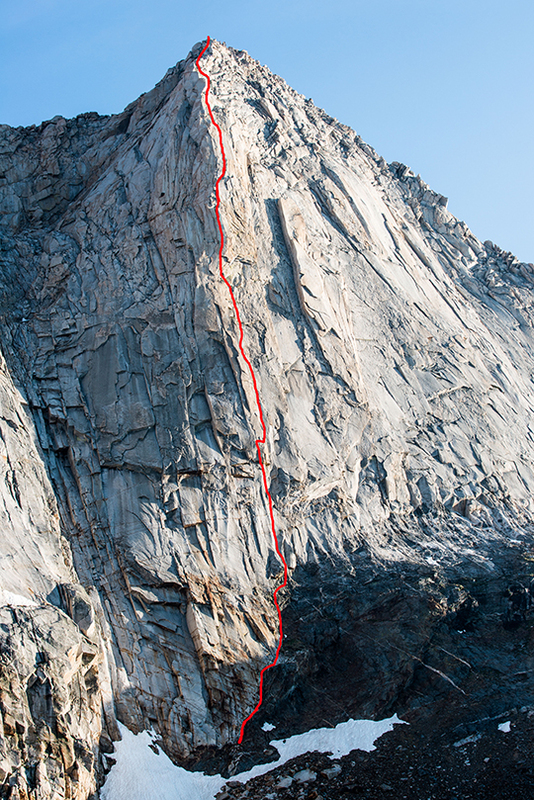 Their unnamed route (5.6, 700') followed cracks and corners up the cliff. A year later in 1975, Sierra heavyweights Galen Rowell and Vern Clevenger established a new line on the right side of Spring Lake Wall. They were later surprised to find that the indomitable Fred Beckey and his partners had made the first ascent of the north face only a year before. The pair named their line That's a Sheer Cliff (5.10a, 1,000') after a hiker's admonition as they approached the wall. Rowell wrote in the 1976 American Alpine Journal: "As we veered from the unofficial trail to approach the face, a backpacker began yelling at us excitedly, 'Come back! Come back! That's a sheer cliff!'" 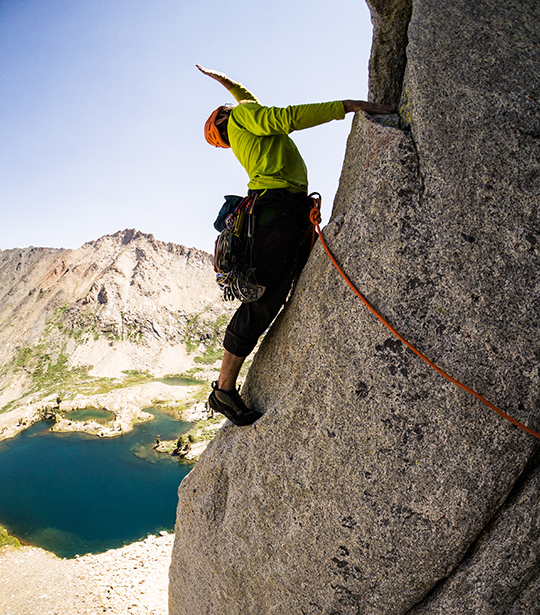 In spite of the peak's high-quality granite and beautiful alpine setting, few climbers have seen Spring Lake Wall in the 40 years since the first two ascents. This is likely because the southern region of the High Sierra, home to Peak 11,440+, is rarely visited by climbers. The peaks and cliffs in the Mineral King area, while overshadowed by taller mountains to the north, offer many fine objectives for the adventure-minded climber. On June 24 this year, Siadak and I were lured into the Sierra by this sheer cliff. 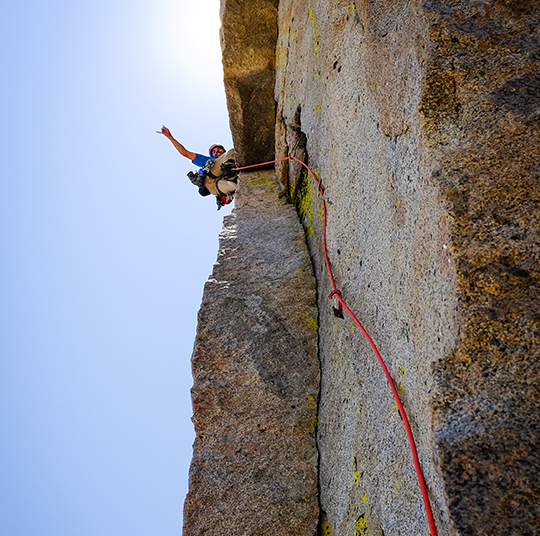 We established a new route up a prominent sun-shadow arete in the center of the face, climbing nine pitches up to 5.11. The line follows corners and cracks straight up the face from base to summit for about 1,500 feet. We named our route The One That Got Away (5.11b C1, 1,500') because we believe this obvious route up the central face had remained unclimbed over the past forty years. The name also plays off the incredible fishing in Spring Lake, which teems with trout. For the most part, the route climbs a mixture of well-protected splitter cracks from fingers to full-body chimneys. We climbed the entire route ground-up and onsight, team-freeing all but a 30- to 40-foot section of vegetated cracks on Pitch 2. We climbed this section at C1, but believe it will go free at 5.10 once cleaned. The third pitch was the crux, a perfect splitter finger crack through a small roof and up a shallow corner (5.11b). As I hoped, the crack ended at a perfect stance, allowing us to connect to more cracks and corners that led to the summit ridge. At times we ventured upward through corners split by myriad cracks and perched blocks, traversing across smooth faces from one corner system to the next. We carefully avoided dislodging loose blocks, found good gear, and deciphered the easiest path—we called the climbing thought-provoking 5.10. 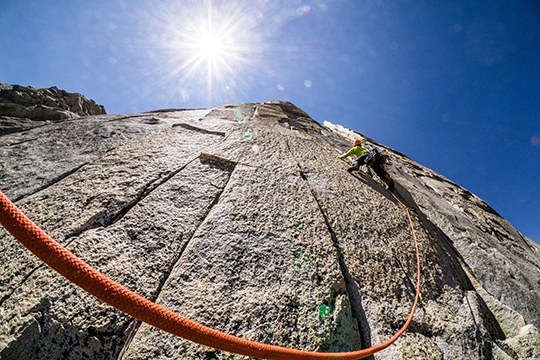 High on the wall, a beautiful pitch climbs a finger crack and flakes through a roof and then slowly widens over a stretch of 100 feet from off-fingers to chimney, requiring us to jam every size in between. We left no sign of our passage except a few scraped-out cam placements in the vegetated second pitch, and a one-page summit register tucked inside a Ziploc bag. We have little doubt that other routes could be climbed on Spring Lake Wall. Crack systems and corners riddle the north-facing wall, and huge stretches of unclimbed rock lie between the existing lines. On the cliff sector that we climbed, the rock quality is generally good, although a few sections leave something to be desired. The wall is approached by a manageable six-mile hike from the Mineral King trailhead to the southwest. A scramble north from either Glacier Pass or Sawtooth Pass south of Peak 11,440+ leads to the cliff base. Mineral King lies in southern Sequoia National Park, a two-hour drive east of Fresno. This is such a beautiful line. Nice work! The rock quality looks really great! And the line is so aesthetic. Establishing the line ground up is such an accomplishment. Rad! Nice find and great send, Austin!!!! !